Shanghai has been called the Paris of the east, now they&apos;re saying it&apos;s China&apos;s New York. But it should be unique. Shanghai is one of the world&apos;s greatest cities with an entertainment scene to match. Stylish restaurants, quality cuisine and a nightlife that&apos;s full of surprises. Shanghai has always had healthy cultural scene, with cinemas showing foreign and Chinese films, and theatres featuring opera, dance, drama, acrobatics and puppets. as a common understanding, Shanghai has the most colorful nightlife in China. But if you have ever participated, you may feel it is probably the most colorful one in the world! Nightclubs and bars are always booming, with joints opening and closing faster than night can turn into day. Barflies now have a choice of everything from glamorous art deco lounges to the seediest watering hole; live rock and jazz can be heard into the wee hours and the dance club scene now employs djs, foreign and local, to keep the younger set raving. Aptly called the “Paris of the East”, Shanghai is a cosmopolitan city with a huge selection of bars, clubs, lounges, and restaurants. Whether you’re looking for an upscale wine bar, a place to meet expats, a bouncing dance club, brunch, or something more specific, Shanghai has you covered. Funk A Deli is a big, popular bar with expats. It’s a good place for dinner, brunch, drinks, and atmosphere. Guests will find a long list of drinks including wines and cocktails, and quality Italian food. Funk A deli is perfect for relaxed brunches or after work dinner and drinks with a relaxed ambiance. How to get there: Take the metro to Shaanxi South Road Metro Station ( 陕西南路), it’s an interchange station where line 1, line 12, and line 10 meet. Take exit 7 and walk straight [southwest] to Xiangyang S. Road, go left [south] on Xiangyang S. Road ( 襄阳南路) for just over 400 meters, then take a left [east] onto Yongkang Road ( 永康路) and walk about 80 meters. Funkadeli will be on your left. As you might imagine, VUE Bar is a high-end establishment, and the atmosphere and prices reflect as much. You will have a great view of the Bund while you sip professionally made cocktails. 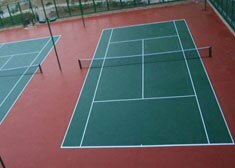 Expect a cover-fee of about 100 CNY that will include a drink. This is the place to take someone you want to impress. How to get there: VUE Bar is right next to the Hyatt on the Bund. If you aren’t staying at the Hyatt, you can get there by taking metro line 12 to the International Passenger Transport Center (国际客运中心). Take exit 3 and continue straight [southwest] down Dongchangzhi road (东长治路) for about 500 meters. Continue across the bridge until you hit Nanxun Road (南浔路), then, take a left [southeast]. After about 250 meters you will reach Huangpu Road (黄浦路), and go right. You’ll be at the Hyatt entrance, head in an take the elevator up to the 32nd floor. Dada is a dive bar and club that features local DJs Thursdays-Saturdays. The atmosphere is less pretentious than a lot of the high-end places, and the crowd is mostly younger Chinese and expats. Prices are moderate-to-low with various drink specials. 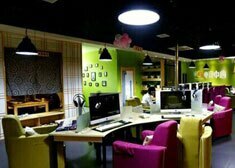 How to get there: Take metro line 10 or 11 to Jiaotong University (交通大学) and go to exit 6. Head straight [northwest] on Huashan Road (华山路) and take a left when you hit the big park (Huashan Greenland, 华山绿地). Continue left [east] until you hit the junction with Xingfu road (幸福路). It will be across Xingfu Road from where you are standing. The gorgeous view of the Bund greets you at this rooftop bar and lounge. On weekdays come for a relaxed vibe to have a drink or two. This is one of the city’s iconic bars, and on weekends it gets packed, so make reservations if you want a table. Unfortunately, it’s become more of a tourist destination than a place where locals hang out, but it’s definitely still worth a visit. Bar Rouge serves a mix of beer/wine, champaign, and cocktails. How to get there: Take the metro to Nanjing East Road (南京东路), and go through exit 7. On Nanjing E Road (南京东路), walk east for about 500 meters, staying right. Take another right when you reach Zhongshan E 1st road (中山东一路). Take a right and Bar rouge will be on the 7th floor of Bund 18, right at the waterside. Not so secret anymore, Speak Low used to be accessible only by telling the doorman you were looking for it and then going through a hidden entrance. Although it’s pretty crowded these days, this bar is a must-go if you are visiting Shanghai. Speak Low focuses on unique and strong cocktails primarily, and has been listed as one of the world’s top 50 bars. How to get there: Take metro line 1, 12, or 10 to Shaanxi South Road (陕西南路). Take exit 4 and walk right [south] on Maoming S Road (茂名南路) for about 450 meters. Take a left and walk East on Fuxing Middle Road (复兴中路) for about 350 meters and it will be on your right. There is a bar on the 2nd and 3rd floor, but if you want to find the secret entrance to the last bar, you will have to go there yourself. Good food, good cocktails, and a good vibe all add up to make Revolucion Cocktail Shanghai a great all-around experience. 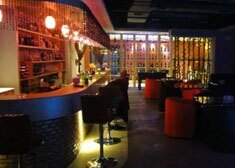 Come for quality specialty cocktails as well as Latin/Western food, stay for the great atmosphere and music with a Cuban flair. How to get there: Take metro line 1, 12, or 10 to Shaanxi South Road (陕西南路). Leave through exit 7 and then walk straight to Xiangyang S Road (襄阳南路), take a left and walk south about 400 meters until you reach Yongkang Road (永康路). Take another left and walk east] about 70 meters, it will be on your right, next to Cafe del Volcan Café del Volcán. Boasting the highest rooftop venue in Shanghai, Flair Bar offers a luxurious view of the city that is second to none with a chic, stylish atmosphere. With contemporary and décor and architecture, and amazing service, Flair offers a high-end experience at the top of the city. Flair serves food, cocktails, beer, and wine- come for dinner and watch the sun go down and the lights come on. How to get there: Take the elevator up to the 58th floor of the Ritz Carlton. If you aren’t already staying at the Ritz, you can take metro line 2 to Dongchang Road (东昌路) and then exit 4. Walk northwest on Century Avenue (世纪大道 ) for a bit over 1 kilometer. You won’t miss the Ritz-Carlton on your left by the Shanghai International Finance Center and across the roundabout from the Pearl. CJW stands for cigars, jazz, and wine...what’s more to ask? For those looking for something outside the normal bar/lounge circuit, CJW offers something different in a Shanghai bar. Primarily serving whiskeys, wine, and beer, you will pay a little extra for the atmosphere and the view, but it’s worth it to experience one of the last hole-in-the-wall jazz bars in Shanghai. You can also listen to live soul, funk, and blues at CJW. How to get there: Take subway line 10 to Yuyuan Garden (豫园). Leave through exit 1 and walk straight [north] on Henan Middle Road (河南南路 ) for 400 meters. Take a right [east] on Ya’an East Road (延安东路). After about a 130 meter walk, go left [north] towards the Bund Center, go up to the 50th floor, and you’ve made it. Live music, Western food, a good beer selection, and a homey vibe make this bar a nice hang-out spot for locals, tourists, and expats alike. The Tipsy Fiddler feels like a slice of home for many from the UK. You won’t find a more appropriate place to have a pint in Shanghai. How to get there: Take metro line 10 or 11 to Jiaotong University (交通大学), then exit 5. Fahuazhen Road (淮海西路) will be right behind you, walk to Fahuazhen and go left [northwest] for about 100 meters until you hit Xingfu Road (幸福路) and it will be on your right. Those looking for a bit nightlife off the beaten path should look no further. Riink is a roller bar. Have a drink, skate around the floor (yes, it’s shaped like a skating rink), or just take it all in from a seat. Riinks beers, cocktails, neon lighting and unique theme make this bar a one-of-a-kind experience. How to get there: It’s very close to the Marriot Shanghai. Take metro line 4 or 12 to Damuqiao Road (大木桥路), to exit 6. Walk south to Zhongshan South 2nd Road (中山南二路) and take a right [northeast]. Continue for about 600 meters. Go right on Rihui E. Road (日晖东路) for about 200 meters, and then go left on Longhua East Road (龙华东路) for about 400 meters. Finally, take a right on Dapu Road (打浦路). Riink will be on the right. Huangpu river cruises run from 10am until 9pm and the cruises after 6pm are most popular. 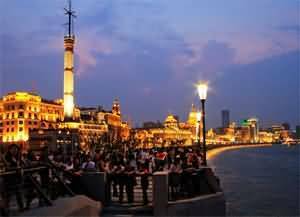 They provide a spectacular view of the Bund and Pudong District by night. It is rated by some as equal to that of Hong Kong harbor at night. The regular cruise ships start from the Bund and pass the Oriental Pearl TV & Radio Tower, Binjiang Avenue and return to the Bund after reaching Yangpu Bridge. This is the most spectacular view. This allows passengers to appreciate the contrast of modern skyscrapers with the classical European buildings which are beautifully lit. Cruises including dinner are available for about 200 Yuan/person or just take in the sights for 100 Yuan/person. The cruises last for 40 minutes to 1 hour. The cruise ships are operated by 3 cruise companies. Routes and prices may vary a little but all ships include the main sights. Night shows are a highlight of Shanghai nightlife and Shanghai has many to offer. 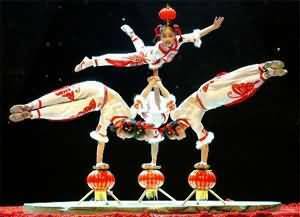 The most special and popular ones for foreigners are Shangcheng Acrobatic Show and Era Intersection of Time. Getting There: Take Metro Line 2 and get off at Nanjing West Road Station(南京西路站). Night markets are definitely a good way to see a city and experience local life. Shanghai is no exception. The night markets are usually local food streets and grocery streets. Street food is very popular with locals, especially the young people. Good food is very easy to sell. Most night markets starts at about 8:00 pm and close at almost 1:00 am. 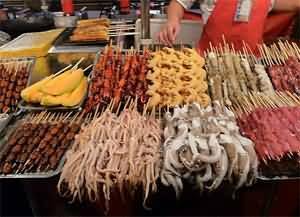 There are many different goods sold on this street but the street food is most famous. The most popular food is Zhou Bin Chou Tofu (Smelly Tofu). 2 hours is enough time to explore the market. The main offering is seafood. It starts at 5:00 pm and close at 3:00 am. The most famous restaurant is Lao Si Shao Kao Restaurant(老四烧烤馆). 2 1/2 hours is recommended for the visit. Barbecue is a major highlight of Shouning Road and especially crayfish. Er Zi Barbecue Restaurant (二子烧烤店) is very popular. It provides take-way service so that visitors could enjoy crayfishes in other restaurants and taste barbecues from Er Zi Shan Kao Restaurant also. These night markets are very popular with locals because they provide almost everything cheaply. Clothing, hats, shoes, flowers, animals, books and CD are all available. Street food is also available. 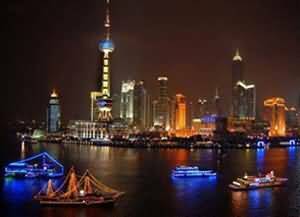 Shanghai by night can be simply enjoyed by yourself and combined with dinner or a drink. The French Concession, the Bund, Xintiandi and Sinan Mansions are quite easy to enjoy by yourself. Road signs are good. These areas provide good photo opportunities. Former French Concession has many cafes and specialty stores which sell interesting items. The French Concession is a very popular and trendy area. Hengshan Road, in another part of the French Concession has a pub culture and is a great place to watch a football game, listen to live music, dance etc. With many good restaurants, outdoor seating and live tunes music, Xintiandi has become the hub for nightlife in Shanghai and Sinan Mansions has a number of high end cocktail bars. On the other side of the road is the Bund where bars of all sorts abound. Bar Rouge is considered the must-go place for first timers. It has a great view but is expensive. Reservations may be required.